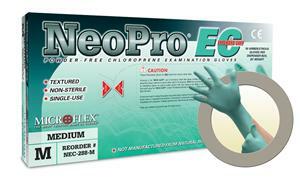 Neopro EC Powder-Free Exam Glove (High Risk Glove NFPA Approved) Combines the barrier protection of a synthetic glove with the comfort, feel and fit of latex. The gloves are 100% synthetic to help alleviate the incidence of adverse reactions associated with natural rubber latex protein in patients and wearers. Longer and thicker than a standard examination glove for greater durability and protection over the wrist and arm. Textured fingers for better wet and dry gripping. Ambidextrous. Thickness data: cuff, 4.9 mils; palm 5.5 mils; finger 7.5 mils. Recommended for use when: Contact with specific chemicals is a standard activity each day. Tasks require the strength of a synthetic and the comfort of latex. Working in wet environments, where an enhanced grip and tactile sensitivity are a must.